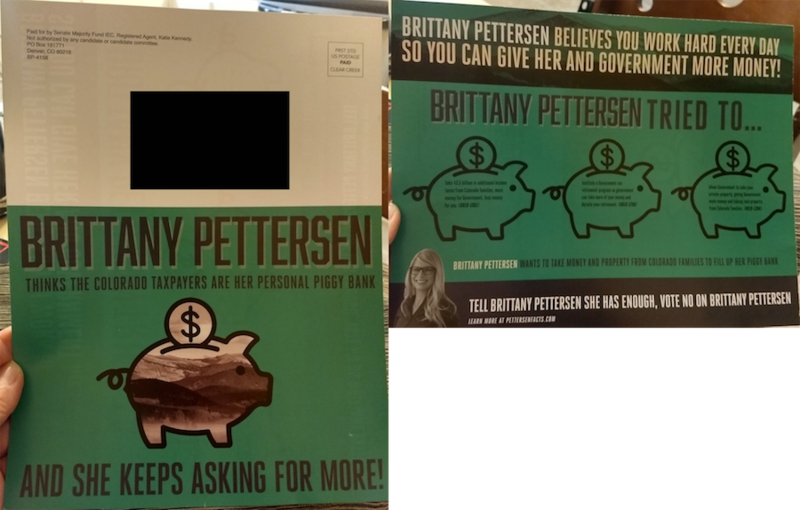 This mailer from Republican super PAC Senate Majority Fund says state Rep. Brittany Pettersen wants to take people's money and property away to provide more government. Pettersen is running for an open Senate seat in southern Jefferson County against Republican Tony Sanchez. Her vote for a measure to improve family leave by charging an insurance premium of less than 1 percent of wages for all employees in Colorado. Because the program would have been considered an enterprise under state law, it wouldn't have qualified as a tax; higher taxes require voter approval. The $3.5 billion number appears to be the maximum amount the measure would have raised over a few years. Her sponsorship of a bill to study the feasibility of a state-operated retirement plan for private sector workers. The measure died in the Senate. It's unclear if the program would have been mandatory, since the bill only called for a study. Her vote for a bill tthat would have allowed the Department of Revenue to sell confiscated property when people in bankruptcy owe state taxes. The bill died in the Senate.